Rudolf Ribarz is one of the most important Austrian Impressionist painters of the 19th century. In 1868 he became a member of Vienna´s Kunstlerhaus (Art House). From 1876 till 1892 the artist had been living in Paris were he met Donbigny, Dupre and Corot. 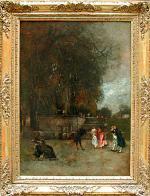 During this period he visited Barbizon, Normandie and travelled to Holland. In 1892 Ribarz came back to Vienna to head a department of the Art School. 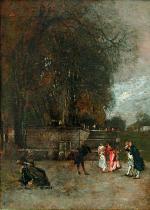 The artist´s composition of this picture illustrates the daily life of the bourgeoisie in the gardens of Versailles, 22 km southwest of Paris. 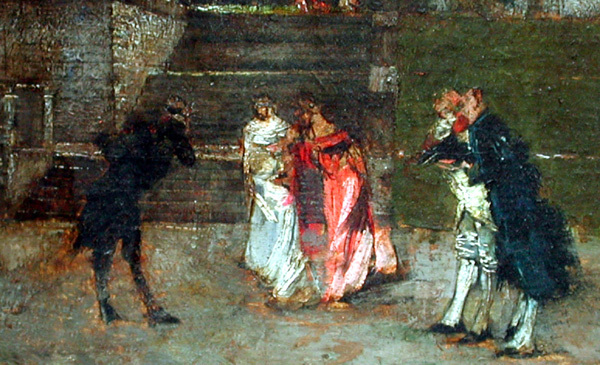 This gallant scene: two ladies and a musican with violin are depicted on the stage near the promenade of Versailles with an alley serving as backdrop. This picture was painted in the 80s. It was many times exhibited of afterwards, in 1924 during the Art Exhibition Wawra, in 1930 at the commemorative exhibition. . Literature: "Austrian Artists Dictionary "by Heinrich Fuchs, Vienna 1974 ;Thieme/Becker "Lexicon of artists from antique to contemporary", Leipzig, 1999. Technique: oil on canvas. Salon gold-plated frame.